The Chartered Management Institute, on International Women’s Day, used their Facebook Live panel on gender inequality to hammer home the gender pay gap among managers using an innovative video strategy. The panel was delivered as a Facebook Live on the CMI’s page and appeared to all viewers as a pretty standard stream but with a surprise for male viewers. The stream used Facebook’s ability to deliver different lives depending on viewer’s profile characteristics. Two streams were actually being delivered, one visible to males and the other females. The differences on the male’s stream were designed to illustrate gender differences in the workplace. 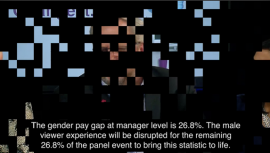 22 minutes into the livestream, male viewers were shown a pixelated stream for the remainder of the panel event highlighting the gender pay gap among managers based on data from the CMI’s ‘Mind the Gender Gap’ report. Male viewers were also not able to ask questions or register votes for polls although this fact was not highlighted until later in the stream. The stream was viewed by just under 20,000 people and received a significant amount of press coverage helping to highlight the CMI’s report.